A jelling ingredient that is produced from animal byproducts. 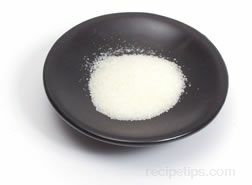 Sold in powder form, one tablespoon of gelatin is generally enough to gel approximately two cups of liquid. Unflavored gelatin is used in sweet and savory recipes to thicken and provide shape to the dish being prepared.